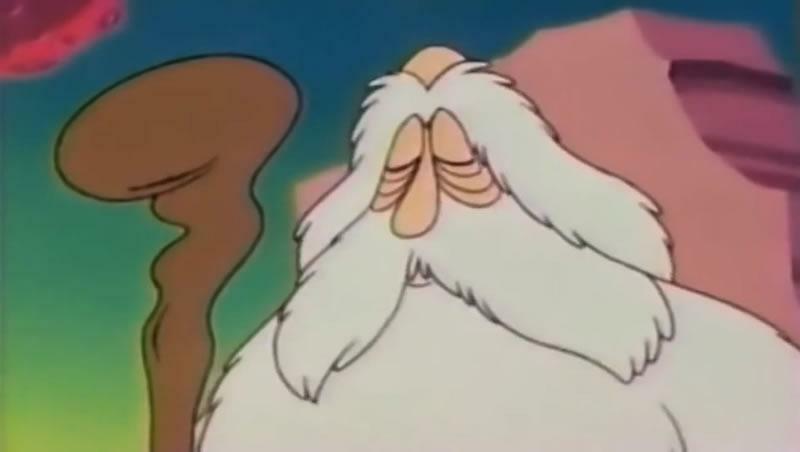 This was an anime movie which was released in Japanese theatres in 1986. 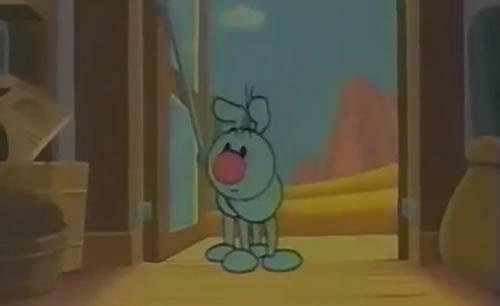 This movie was not released elsewhere, though the DVD remake of it did feature English subs, various fan made English dubbed versions of this have also been created. 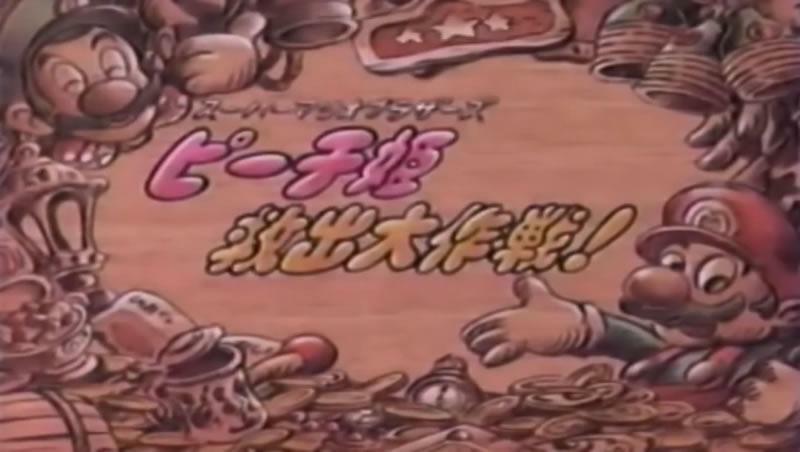 The name of the movie roughly translates to "Super Mario Bros: The great mission to rescue Princess Peach". 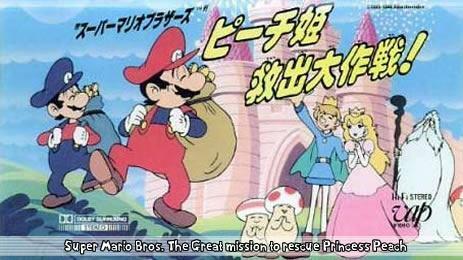 This is an information page about the story, plot, cast and production team of Super Mario Bros: The Great Mission to Rescue Princess Peach. Click here if you would like to watch it online. The story begins with Mario playing videogames in his living room. 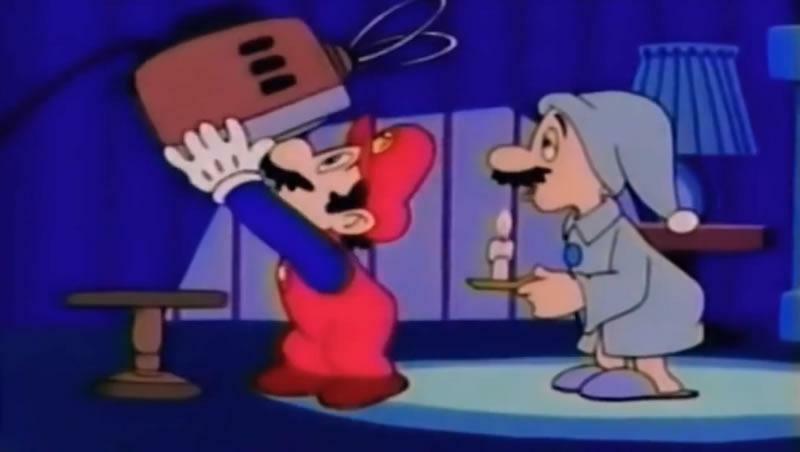 Its getting late and Luigi comes in dressed for bed and offers Mario a drink. 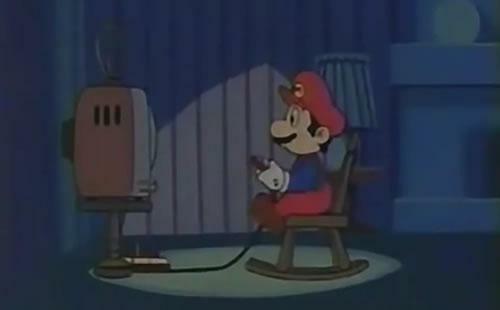 But Mario being the compulsive gamer that he is continues into the early hours. 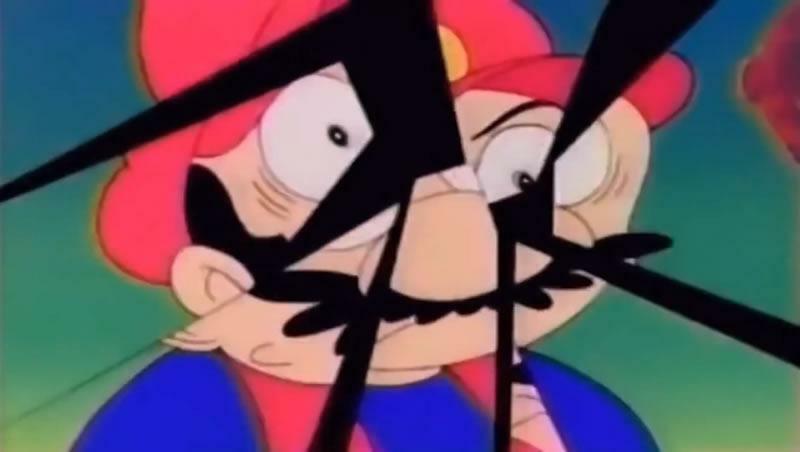 It is then that Mario sees Princess Toadstool for the first time in all her classic gear running from various enemies from the Super Mario games, she then jumps out of the screen in terror and explains who she is and what Bowser is trying to kidnap her. 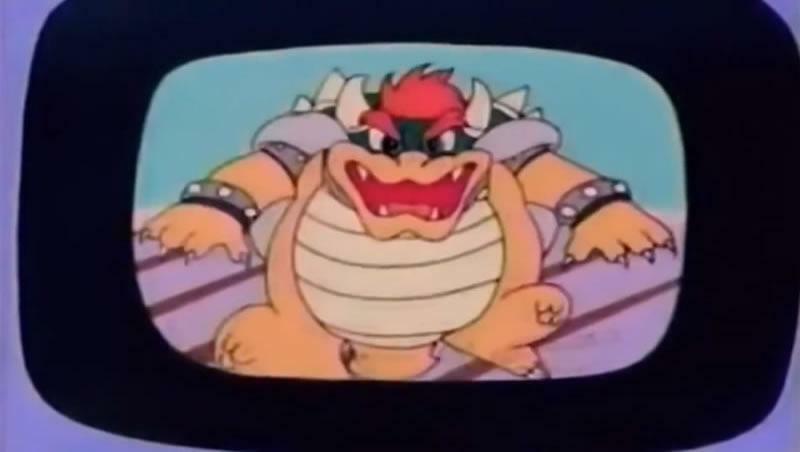 Shortly after Bowser appears on the screen and follows her out - Bowser uses his size and power defeats Mario and takes the Princess back through the television screen to an unknown location. 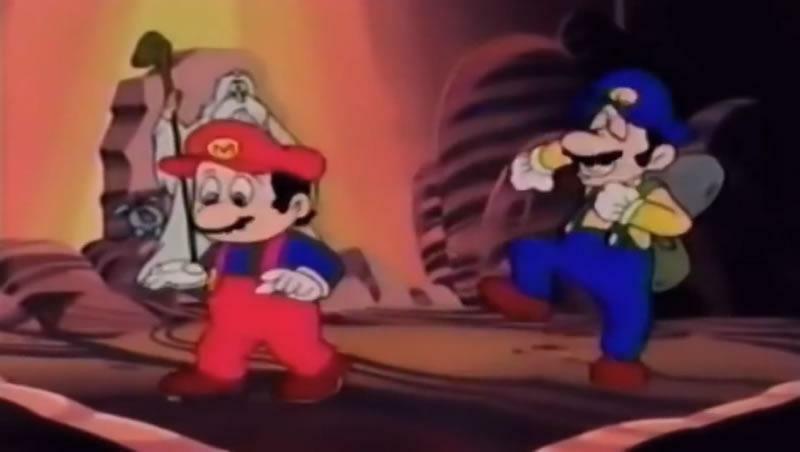 Mario shouts Peaches name and Luigi is awoken and comes to see what all the commotion is about only to find Mario repeatedly talking about a Princess. 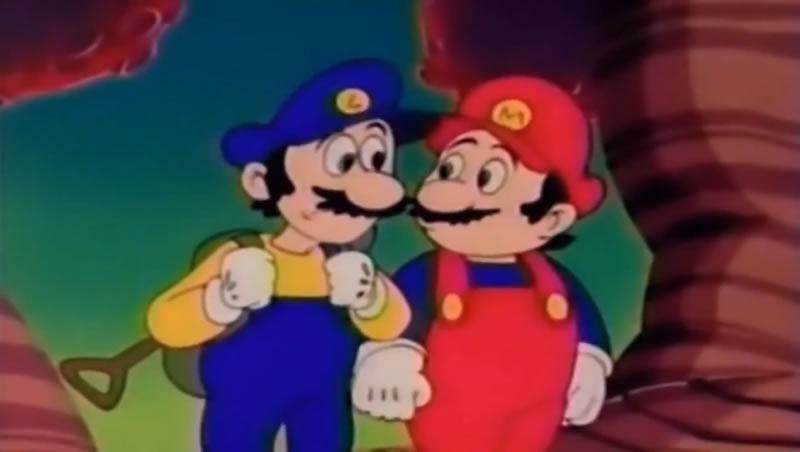 Mario tells Luigi what has happened and Luigi bursts out in laughter thinking that the videogames have melted Mario's brain. 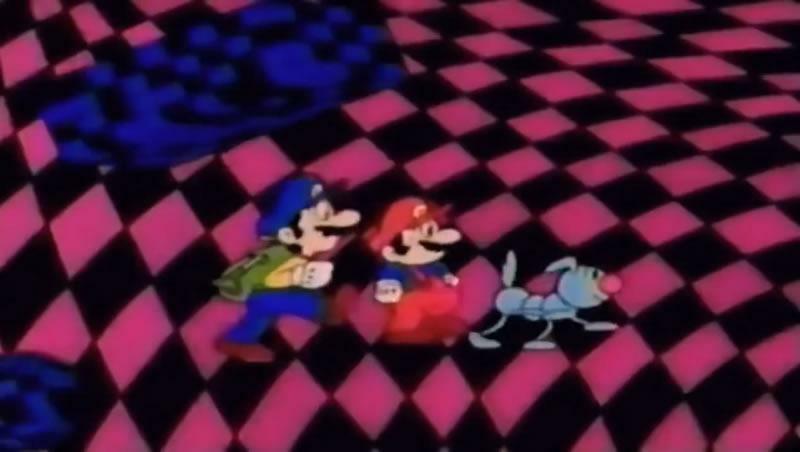 The only thing Mario has to prove that the experience was real and not a hallucination or dream is an pendant which had been left on the floor by the Princess when she got grabbed by Bowser. 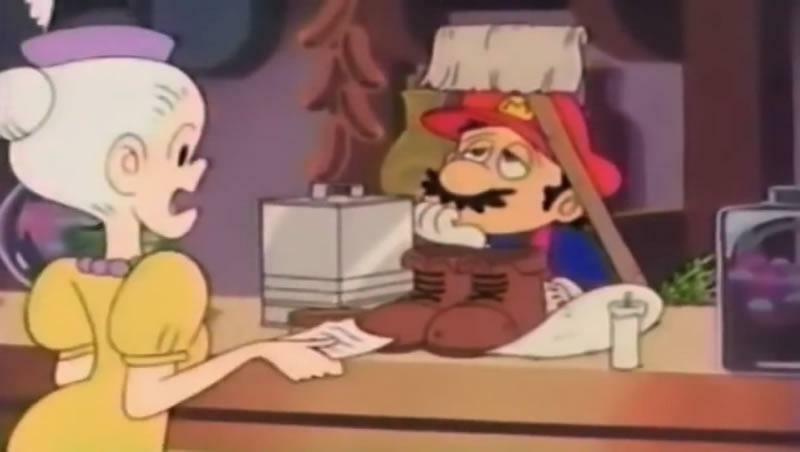 The next day the Mario Bros. return to work as normal in their grocery store but Mario cannot get the previous nights happenings out of his mind and is unable to concentrate on the job in hand, this unfortunately cost Mario a customer when he gave her a broom and some other random items instead of what she asked for. 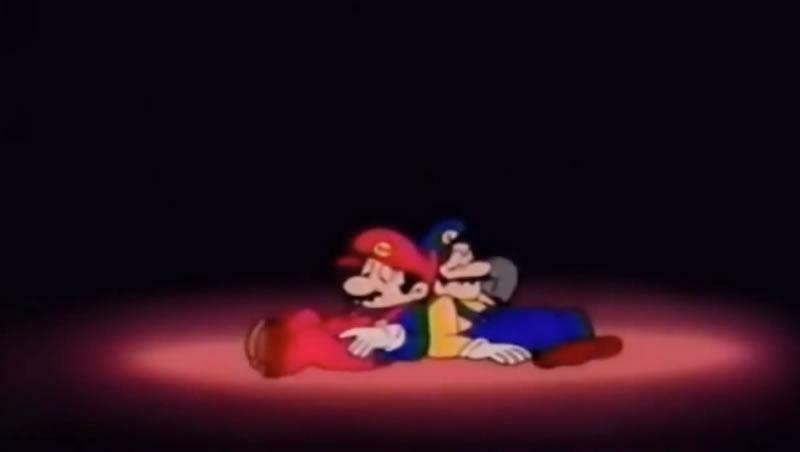 It's just after this that Luigi notices the pendant left by Princess Peach in Mario's hand. Luigi, who is portrayed in this feature as having a great lust for riches immediately recognised the jewel as being a special type of emerald from the mythical Mushroom Kingdom far more valuable and rare than a standard emerald. 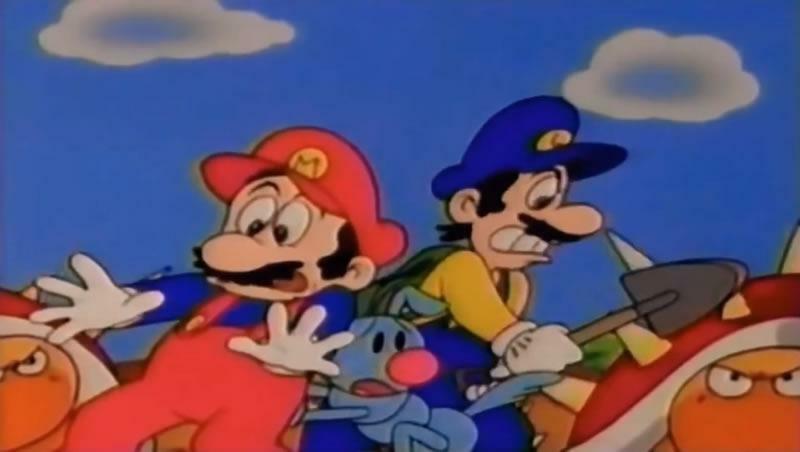 Mario and Luigi argue about what they will use the gem for, Luigi wanting to sell it and Mario wanting to give it back to the Princess - as they look up they notice a blue dog named Kibidango has entered their store, the dog then without warning leaps at Mario grabs the pendant and makes for the door, Mario gives chase out of the store and into the desert. 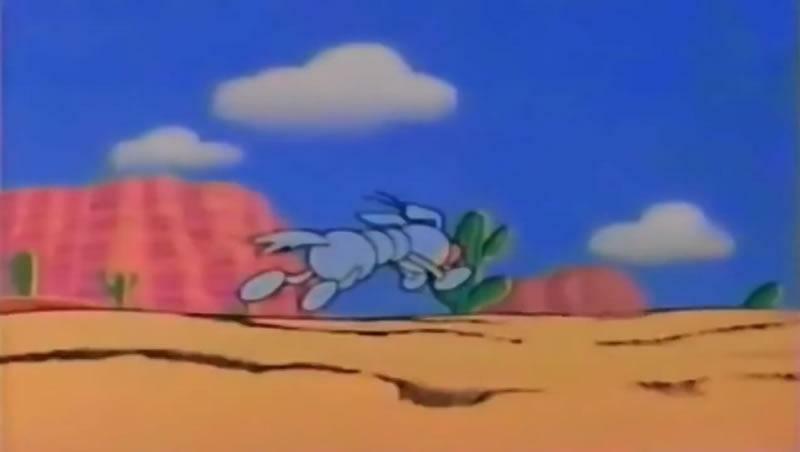 Luigi takes a moment to gather a sack with shovels and other tools in and gives chase shortly after. 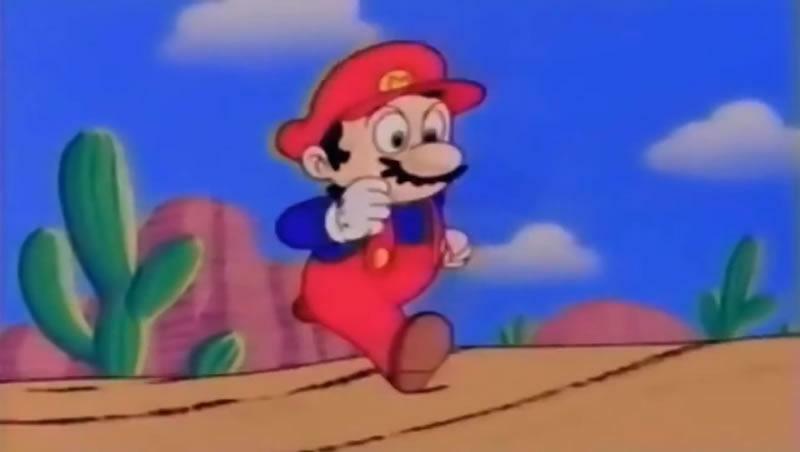 Mario still in pursuit of Kibidango reaches a place with lots of silver pipes, Kibidango runs through a few pipes and then suddenly all but one of the pipes disappears. 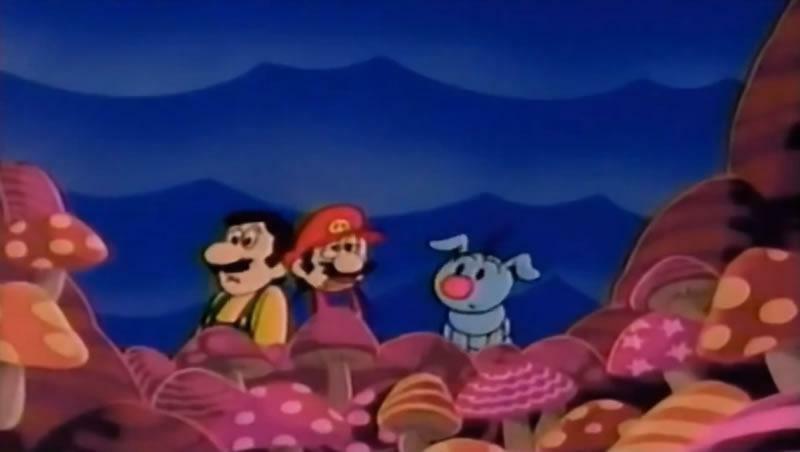 Kibidango enters the remaining pipe and Mario and Luigi follow shortly after. 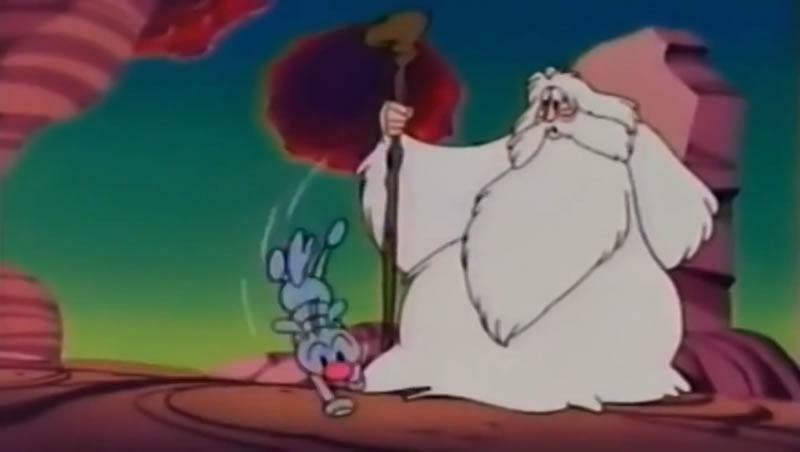 This warp pipe dropped the brothers into a cave inhabited by the Mushroom Hermit, who looks to be some sort of Wizard clad in white robes. 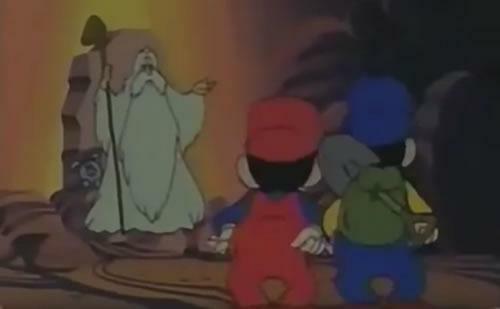 He then tells Mario and Luigi the story and plight of the Mushroom Kingdom and that King Koopa and his forces have invaded, kidnapping the Princess, and causing destruction to the land and people, he also mentions that Mario and Luigi were legendary heroes and were the only ones who could help as Princess Peach had "chosen" them, the brothers celebrated their new legendary hero status by dancing and chanting without considering the implications of their new role. 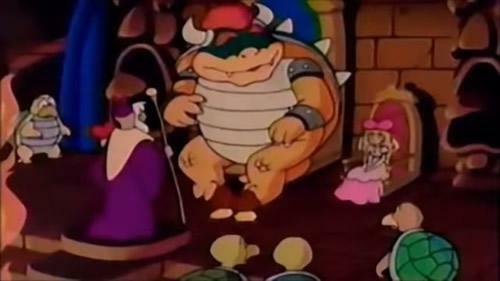 Mario swears that he will defeat Bowser and rescue the Princess who he is already besotted with since their first meeting when she came out of his television set. 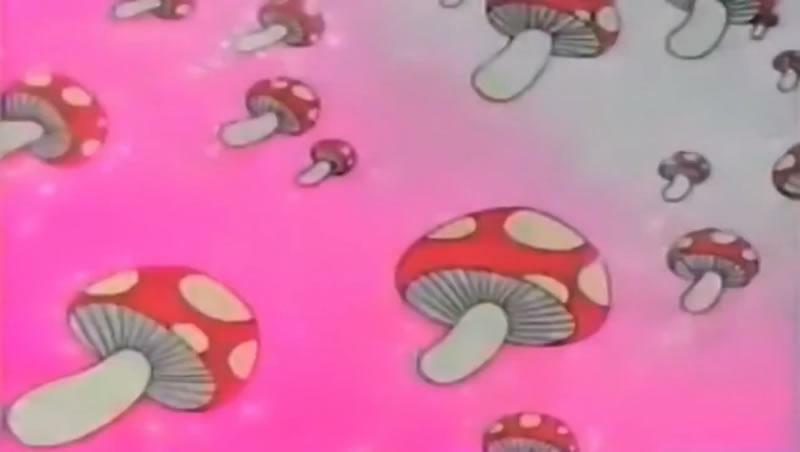 The Mushroom Hermit then explains about some items which will help on their way and how they can be used, the items were classic Mario powerups such as Super Mushrooms for growth, Fire Flowers for fire and Starman for invincibility, it is only through the use of these powerups that the heroes will be able to take on Bowser and his armies and rescue the Princess. 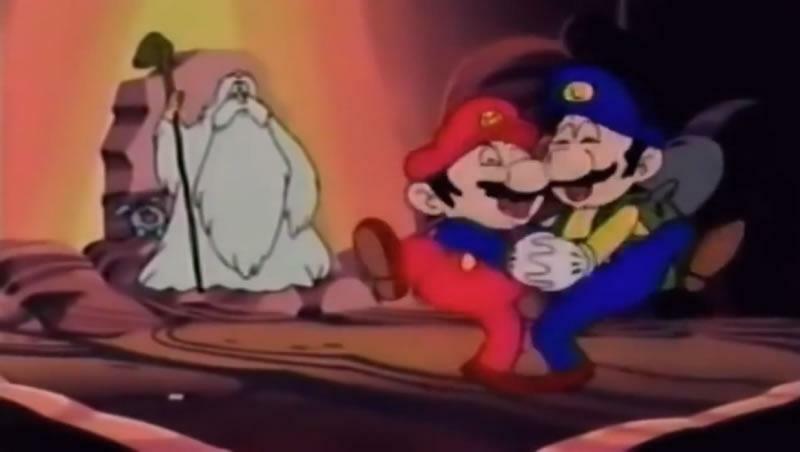 The Mushroom Hermit sees the delight in Luigi's eyes after he mentions treasure and sends Kibidango after them to ensure they don't get carried away with their greed and deal with the task in hand. 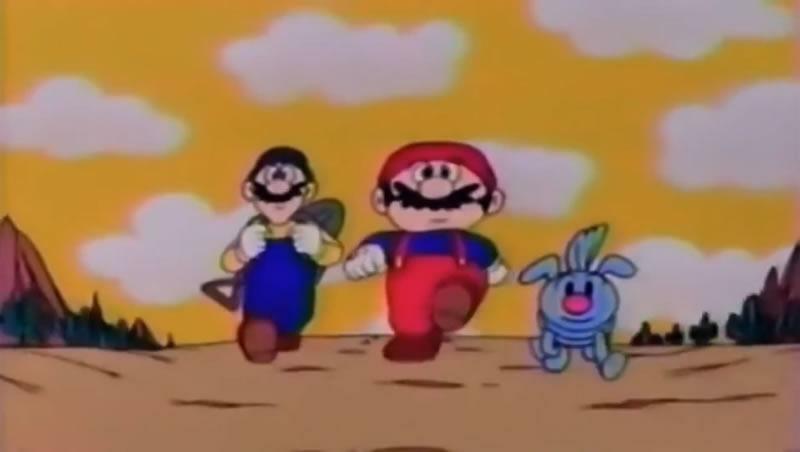 As the Mario Brothers accompanied by Kibidango begin their trek across these strange lands they are spotted by two Goombas who are aware of what they're doing and spy on them. 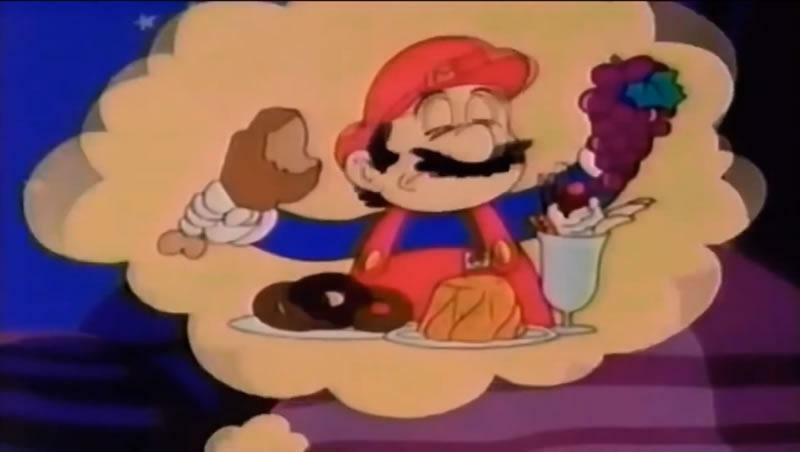 A few hours later the three find a rest spot where Mario starts having various dreams, Kibidango is lying down and Luigi is complaining of hunger and how its stopping him sleeping, at one point Kibidango looks a little too appealing and Luigi hallucinates about him being a cooked dinner and tries to indulge! 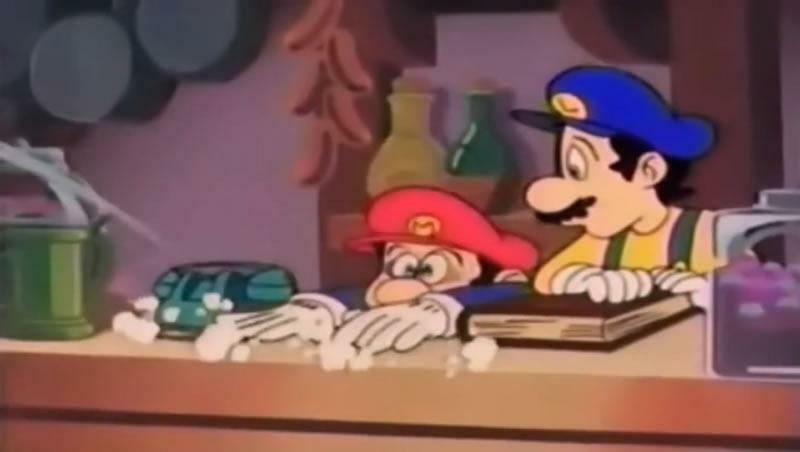 Kibidango doesn't take kindly to this and attacks Luigi who is apologetic, Kibidango then goes to sleep next to Mario and Luigi remains awake. 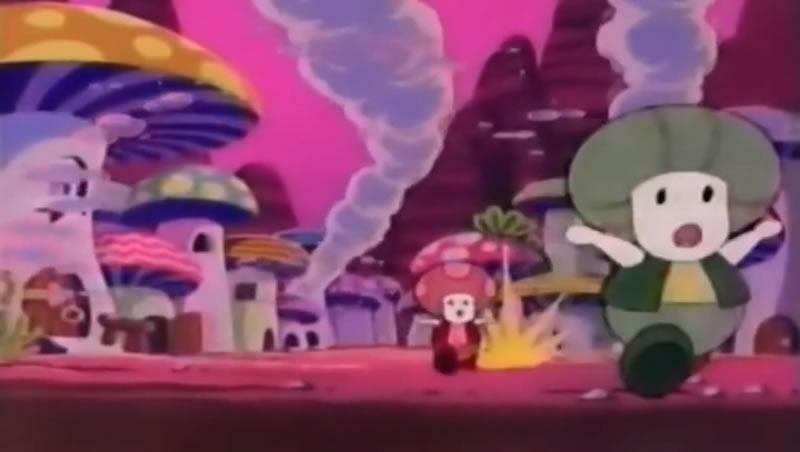 The two Goombas who had been watching our heroic trio earlier on then appear from behind some rocks and tell Luigi they know where he can get some food, he goes with them and is discovered shortly after by Kibidango having fits of laughter, crying and anger after eating the strange mushrooms which are plentiful in this field. 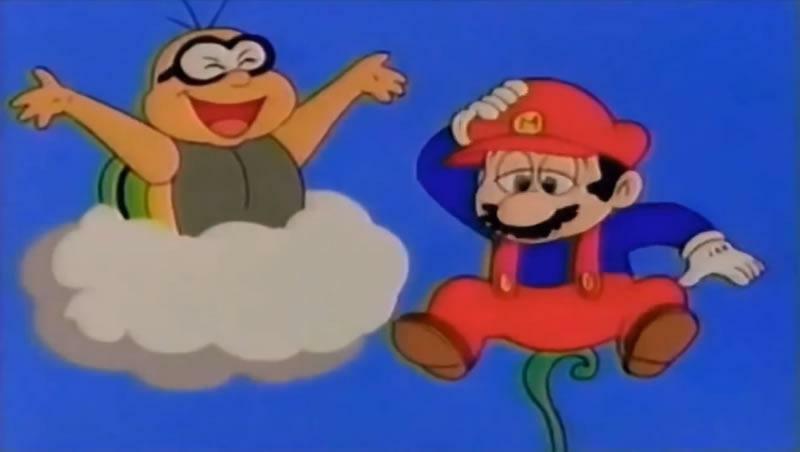 Out of nowhere Mario is then grabbed by a Giant Koopa Paratroopa who takes him to her nest shortly followed by Luigi and Kibidango, intending them to act as food for her young. After some convincing from Mario the chicks decide to stop trying to eat the trio and from their vantage point in the nest they spot a mushroom encased in crystal, Mario climbs up to investigate it and after a struggle pulls it up out of the rock it was stuck in, losing his footing as he grabbed it Mario falls down onto Luigi in the nest below and manages to keep a hold of the crystallized mushroom a whole host of gold coins also dropped out which Luigi was trying to catch frantically in his hat. The team then fall out of the nest and land in the fields below, their falls broken by the chicks from the nest. 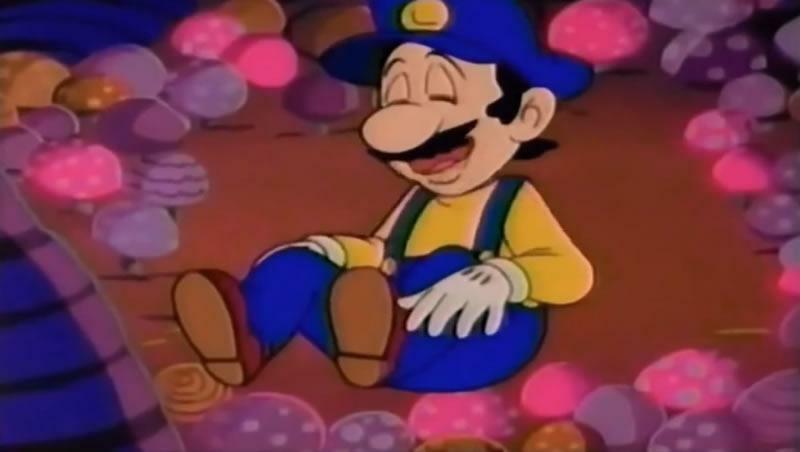 Luigi has managed to salvage one gold coin from the many he gathered earlier and grabs it quickly, the coin then starts shining brightly and out of it a Toad appears before him, the rest of the scattered coins also begin to turn into Toads. 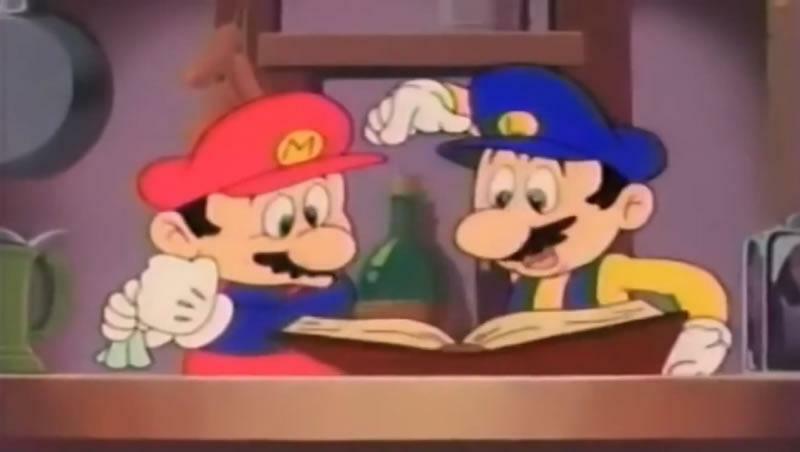 The Mario Bros are silenced in amazement at what they have just witnessed and stare at the Toads, one of them begins to speak and after explaining that Bowser had turned them into coins and trapped them on that mountain they thank Mario and give him a super mushroom to help him on his way. The heroes continue on their mission to reach Peach, and although they aren't really sure where they are going they are no less determined. 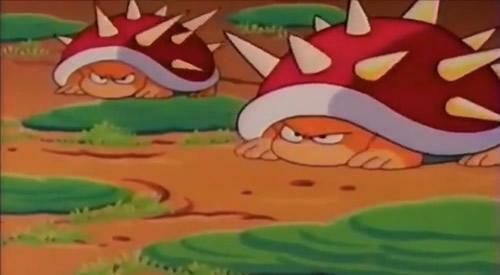 After battling many classic Mario enemies from the games such as bullet bills, koopa troopas etc they come to a crossroads and see the two Goombas again who claim to be mushrooms, they ask the "mushrooms" for directions and the Goombas happily guide them into a huge field of Piranha plants. 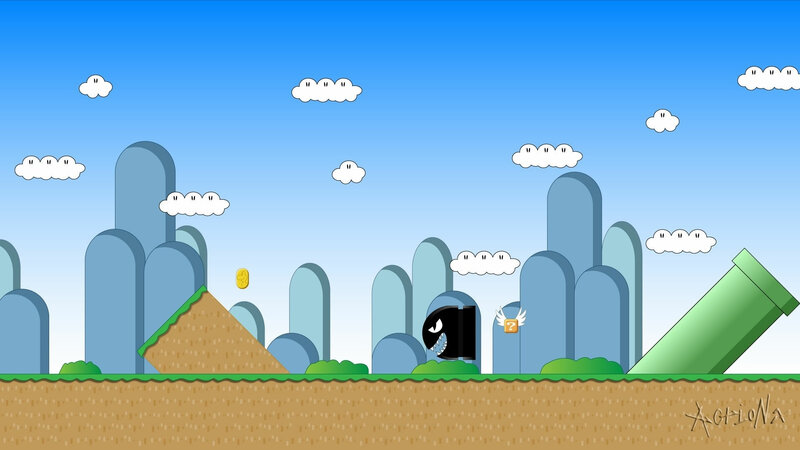 After the heroic trio narrowly escapes this field with their lives they are barely able to catch their breath before things went from bad to worse as they looked up at a cloud and found it to be a Lakitu looming overhead. 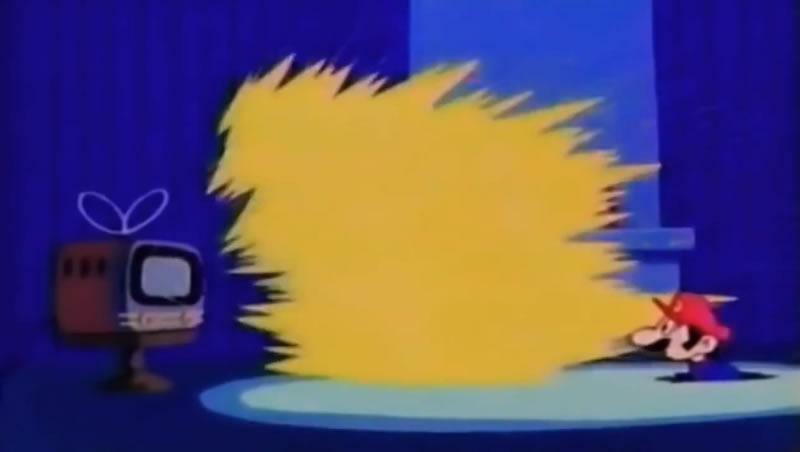 Lakitu tosses several spiny eggs down at the plumbers who thought his intention was to hit them, they mock Lakitu for missing - meanwhile the eggs begin to hatch, Spinies appear out of the eggs and begin attacking Mario, Luigi and Kibidango. 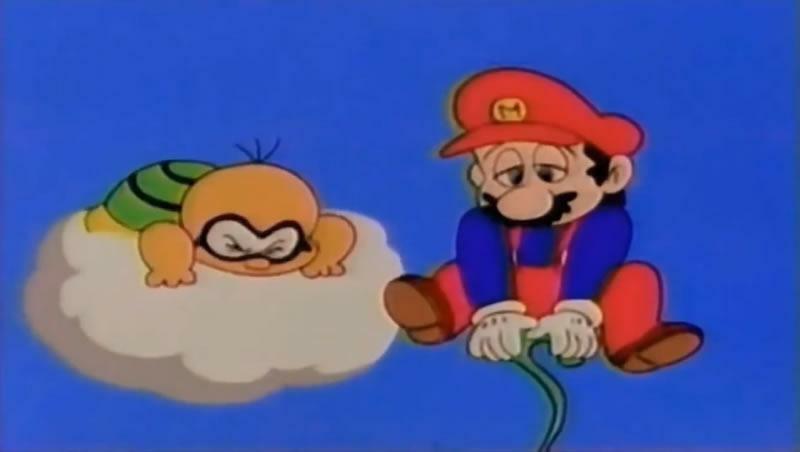 Luckily Mario came across a magic vine which shot him into the sky next to Lakitu, he then managed to grab a portion of Lakitu's cloud before Lakitu could escape and once he had worked out how to control it made a blizzard in order to freeze the spinies, once the snow fades the spinies were gone and the Lakitu cloud turned into another Toad, who thanks Mario and gives him a Fire Flower. 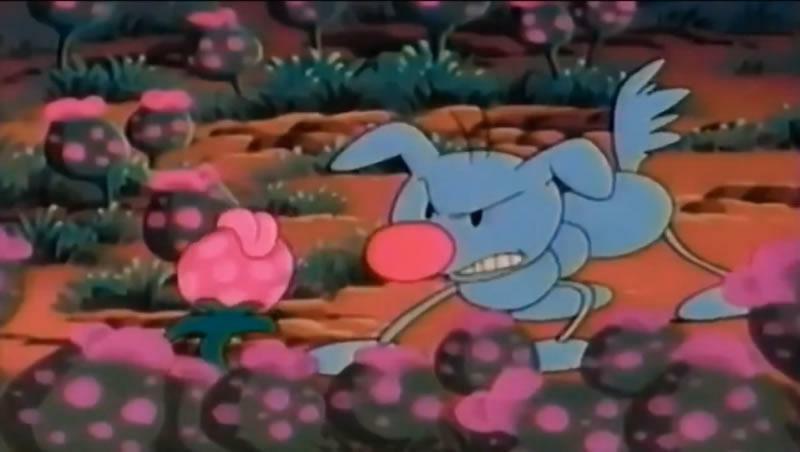 Further along the same path they come across giant Buzzy beetles who Mario defeats by use of his fire flower (despite this not being the case in the games). 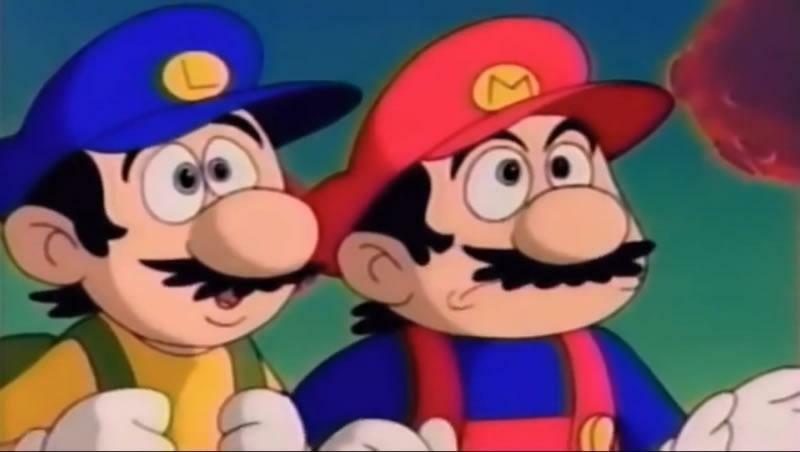 There are some question blocks, Luigi hits one and gold coins come raining down on him, Mario hits one and a load of Mario Bros brand pasta comes out, so they stop for lunch, little do they know that the two Goombas from earlier are watching them. 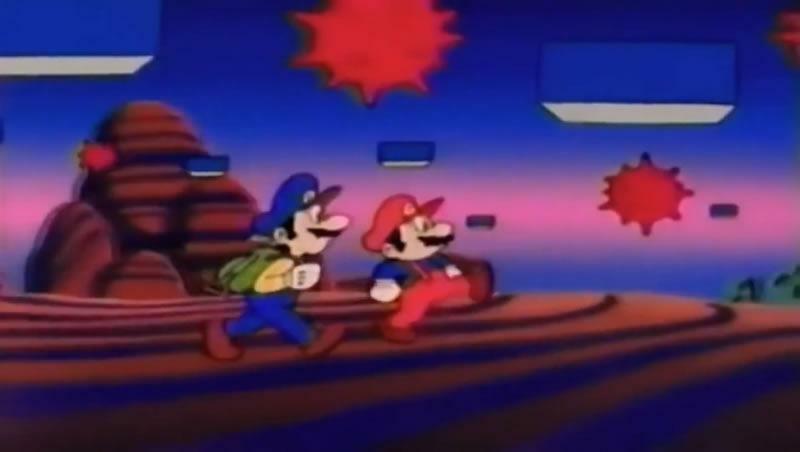 Worried about how close the Mario Brothers & Kibidango were now getting to Bowser's Castle the Goombas plant a trail of gold coins leading into an underground cave resembling the Vanilla Dome area of Super Mario World. 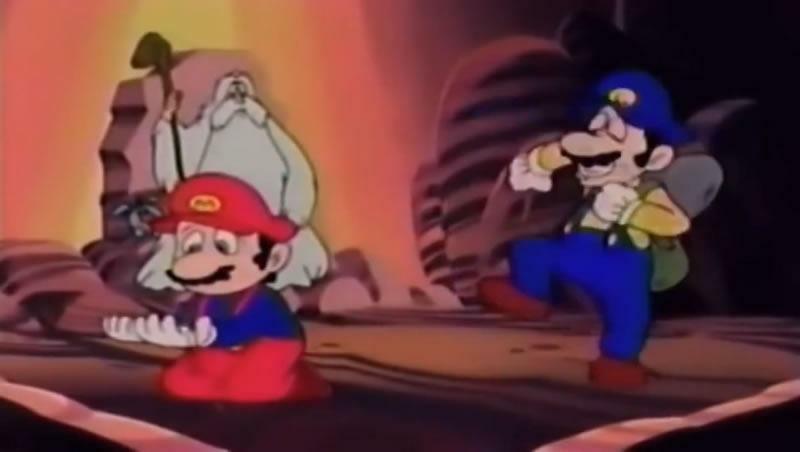 Luigi spots the glint of the first gold coin out of the corner of his eye and the plumbers follow the trail into the cave proclaiming "we're rich!! ", Kibidango reluctantly follows. 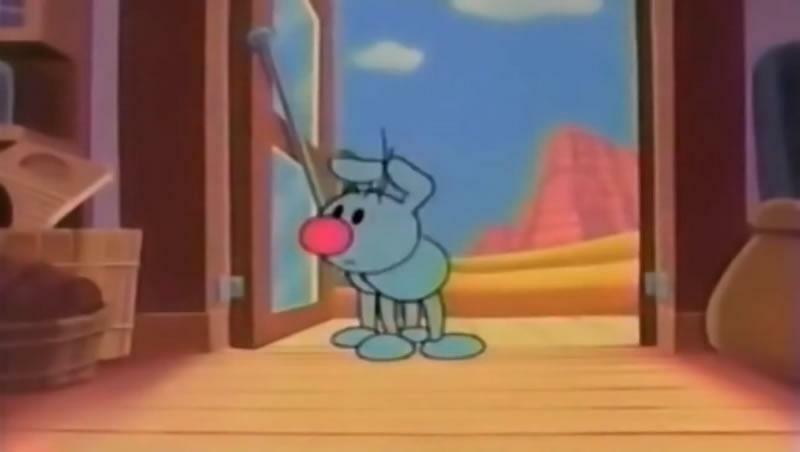 The Goombas then collapse lots of rocks at the entrance of the cave, and taunt the captured three through the bars, they then introduce "Hammer" a lone hammer brother and the strongest of all the Koopas who guards the barred entrance making sure they don't try to escape. 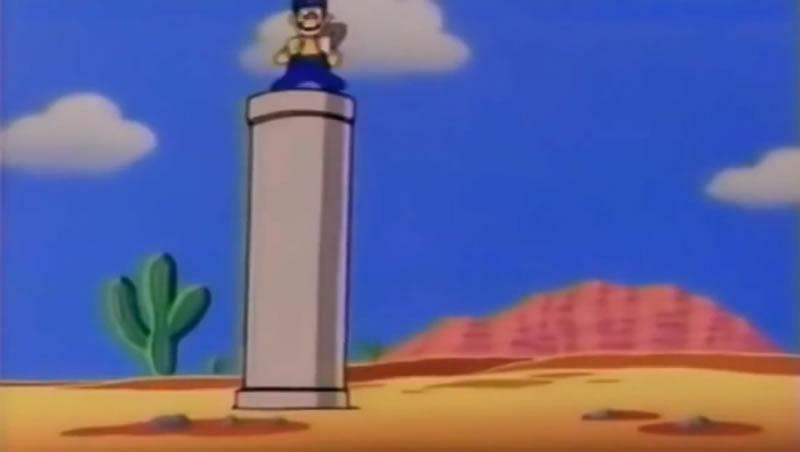 Meanwhile at the top of one of Bowsers highest castle towers Peach resides on a balcony with only her sorrow for company, the firm belief that Mario will come to rescue her still intact. 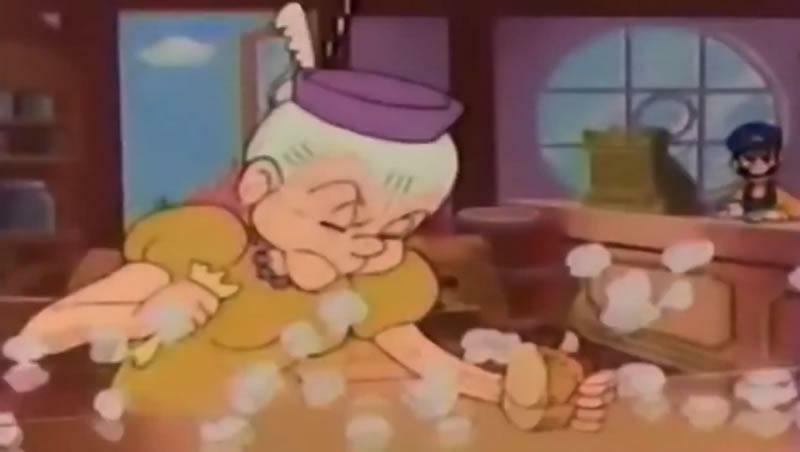 Bowser comes into the tower behind her and tries to persuade her to love him. Princess Peach then tries to trick Bowser, she said she'd like him if he was cute, so he turned into various things; a scarecrow, a dancer and finally into a Teddy Bear. Whilst in his Teddy bear form Princess Peach grabs Bowser and places him into a box and locks it thinking she'd found a way to defeat him. 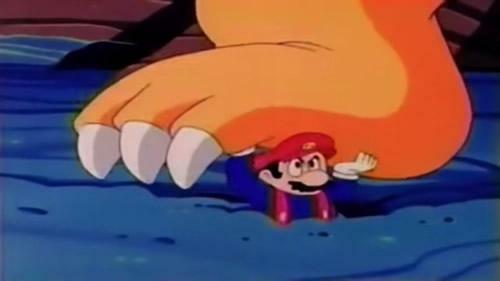 Bowser then reverts to normal size, breaking the box and mocking Peach for thinking she could defeat him and escape. 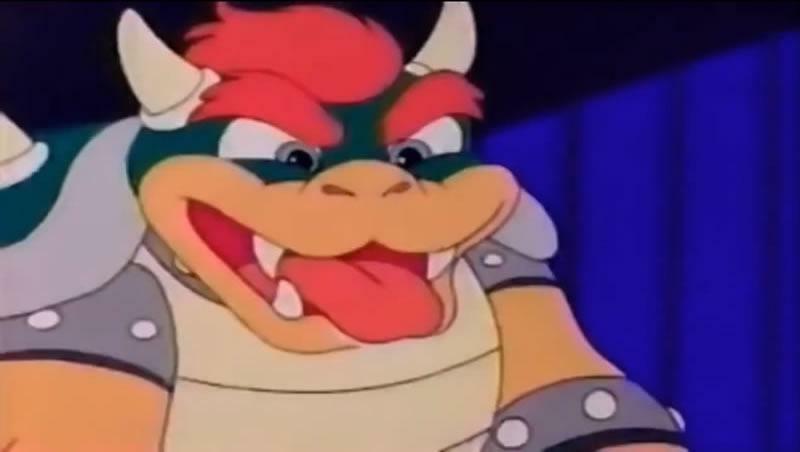 Bowser exits the room locking the door behind him leaving Peach captive in her tower. 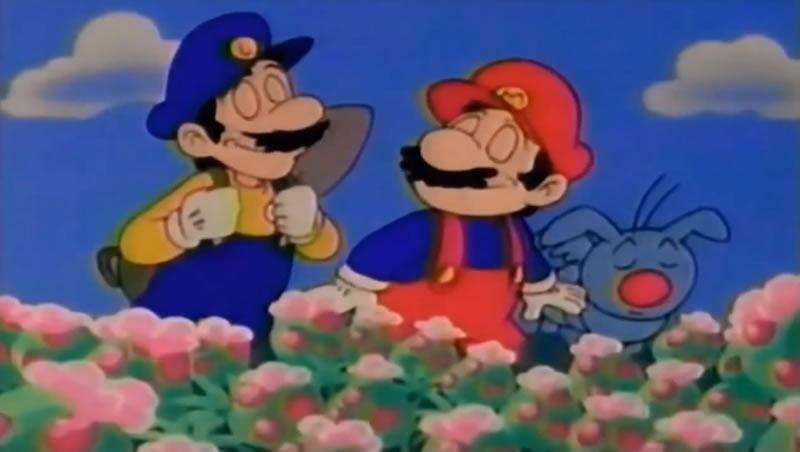 Back in the cave which serves as a prison to our heroes Mario daydreams out yet more fantasies about him and the Princess, this time it seems they are getting married - Mario is wearing a suit and dancing with the Princess in a beautiful garden surrounding. 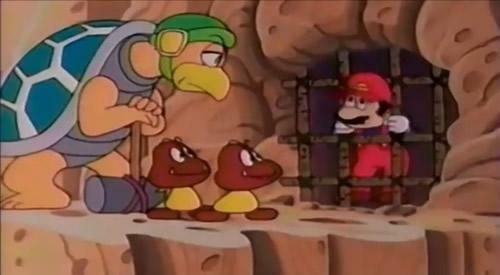 Luigi interrupts this vision as he continues to dig proclaiming that he and Kibidango had found a way out. After getting out the three have a brief confrontation with the Hammer Bro guarding them before escaping. 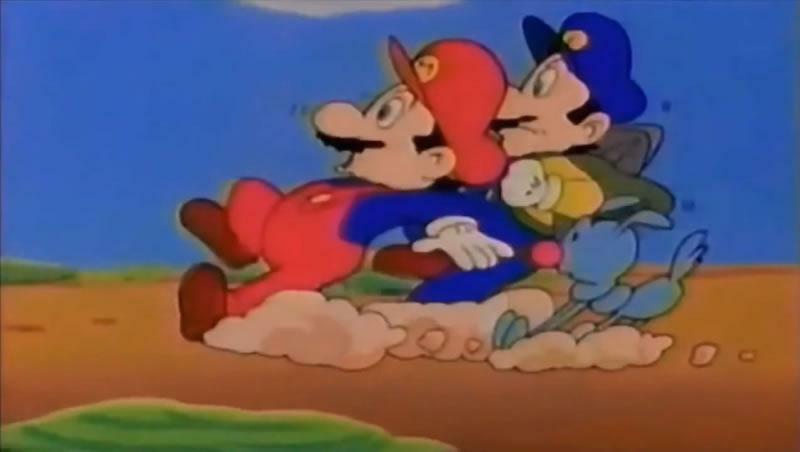 Luigi finds that the gold coins he found in the cave earlier on were fake and throws them at the ocean, luckily Mario noticed a starman amongst them and jumped into the ocean after it. 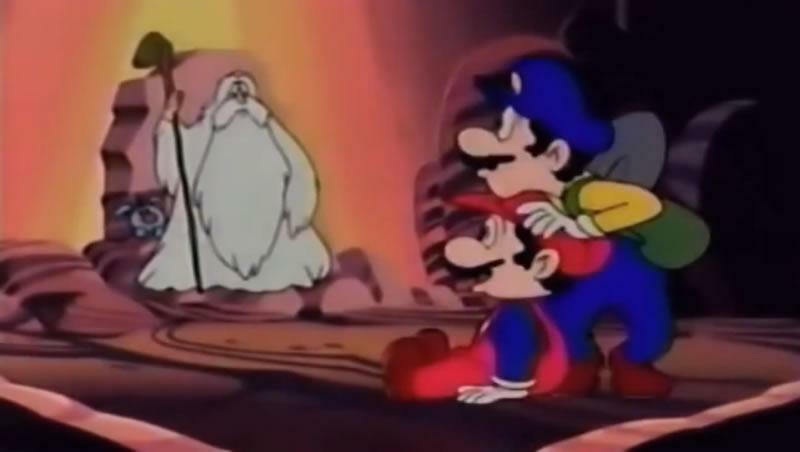 The starman had landed itself inside a giant clam, who then closed up and wouldn't let Mario get the star, after coaxing the clam into opening again Mario managed to get inside and take the starman. After a pursuit from a giant Cheep Cheep the heroes then made it to a sunken ship thinking they were momentarily safe, unfortunately the underneath of this ship was acting as home to a giant Bloober. The heroes frantically piloted the ship out of the water, shook off the giant Bloober and continued on their way to Bowsers castle. Meanwhile at Bowser's castle all of Bowsers finest Koopas are gathered in one of his greatest halls for a wedding ceremony to take place between himself and Princess Peach. The priest begins the ceremony but the Princess does not want to co-operate and the Mario Bros arrive shortly after, Bowser grabs Peach and escapes down a corridor with the triad of heroes in chase and soon Mario finds himself in a room with lots of platforms moving up and down which are suspended over Lava with fireballs and Podoboos. 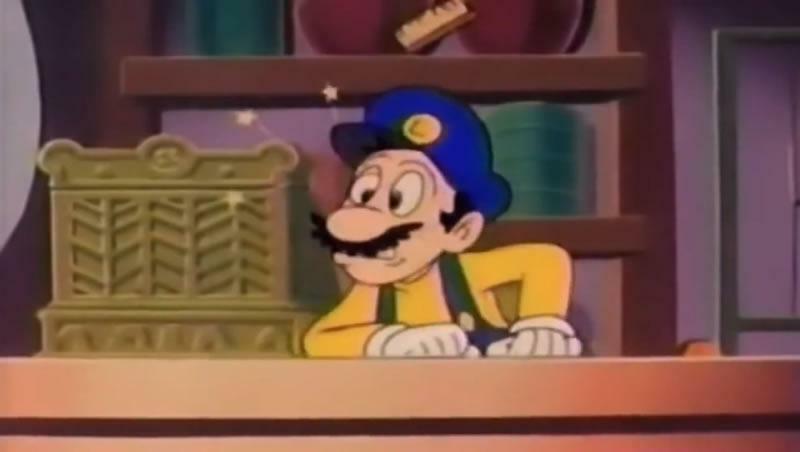 Luigi is not far away and has found somewhere which again may contain golden coins, he finds gold in four different places before hitting a water mains on the fifth, the water comes flying through the walls of the room Mario is in, putting out the fires and getting rid of the fireballs etc. 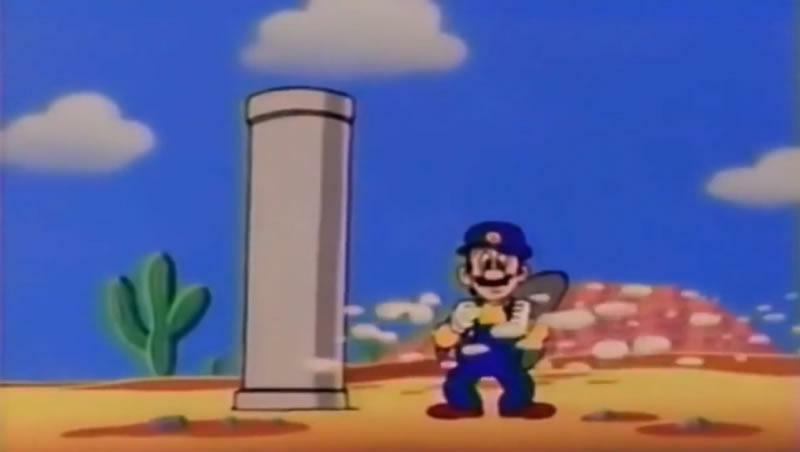 The Mario Bros and Kibidango enter the next room which is where the final showdown with Bowser begins and after Mario initially looks to be defeated, Luigi comes out of the ground and passes him a starman. 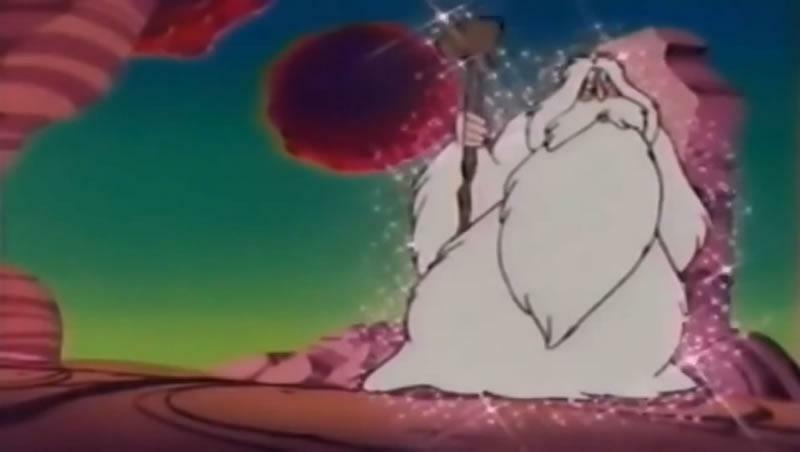 Mario uses the starman to eventually defeat Bowser, rescue Princess Peach and restore peace to her kingdom. 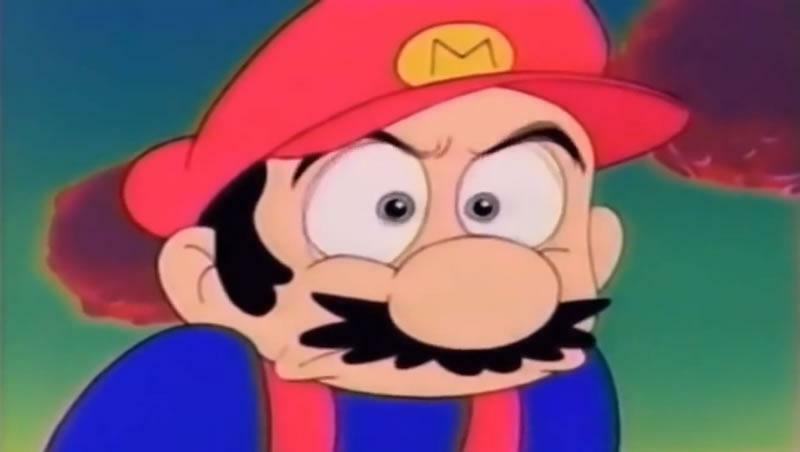 Unfortunately for Mario it turns out that Kibidango was actually a human who had been turned into a dog by the name of "Prince Haru" the ruler of Flower Kingdom and Princess Peaches fiance. 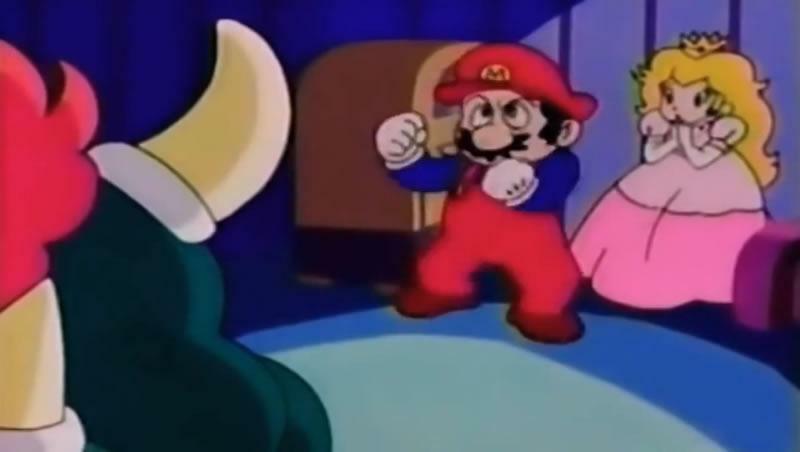 Once Mario realises his relationship with the Princess he passes out in jealousy and shock. Peach thanks the Mario Brothers for saving them and they go home. The final scene of the movie shows Bowser and some of his Koopas are now employees of the Mario Brothers grocery store and the movie ends! The movie was released on July 20th 1986 and the features run time was approx 60 mins. The studio behind this movie was called "Grouper Production" and the company who distributed it on VHS video cassettes "Shôchiku Fuji". 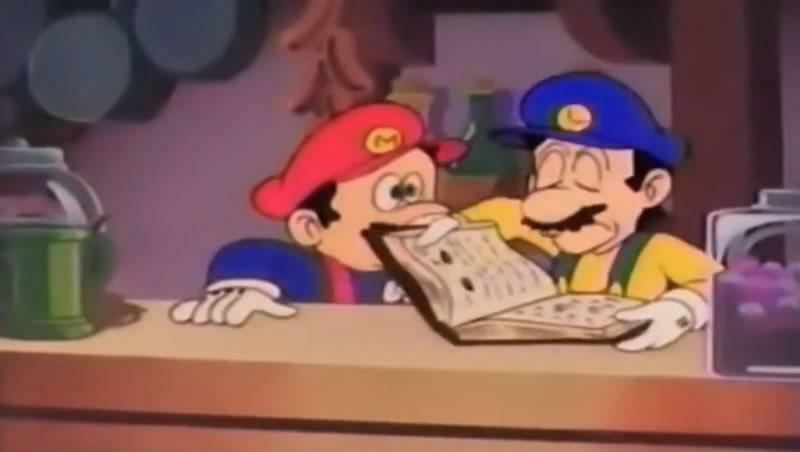 The team who created this movie can be found below with detail of their role, credit for original characters is to Nintendo. Eguchi Takashi, Hanawa Hiroaki, Kadowaki Kôichi, Kishita Yoshio, Kodama Shunji, Koyama Ryô, Kobayashi Akemi, Komamiya Shingo, Kusuda Satoru, Mitsueda Tadashi, Nakayama Katsuichi, Negishi Jirô, Ogawa Tomoko, Satô Atsushi, Takeda Kazuhisa, Takaoka Kiichi, Toshida Kazuyuki, Yamazawa Minoru, Yamashita Satoru, Suzuki Eiji. 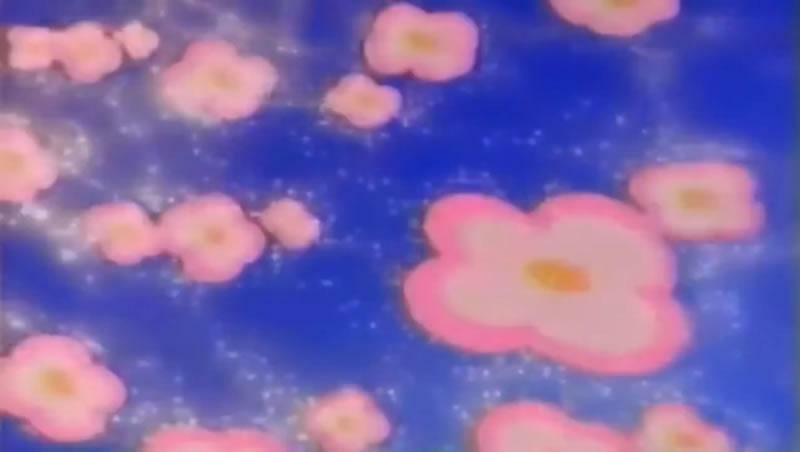 A collection of images and pictures from the movie. 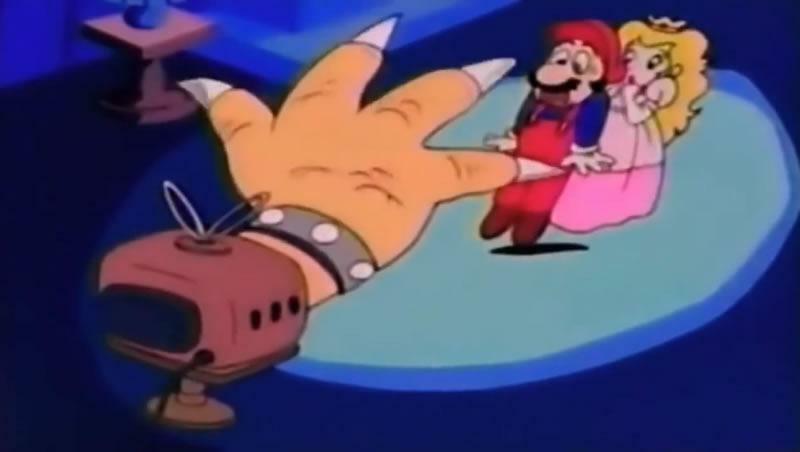 The first Mario TV / Movie production which depicts Bowser as being able to breathe fire. 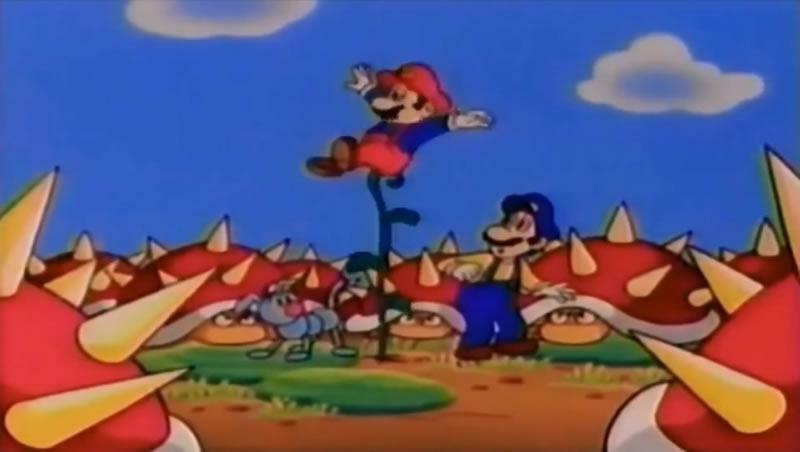 Mario defeats Bowser by swinging him around by his tail. 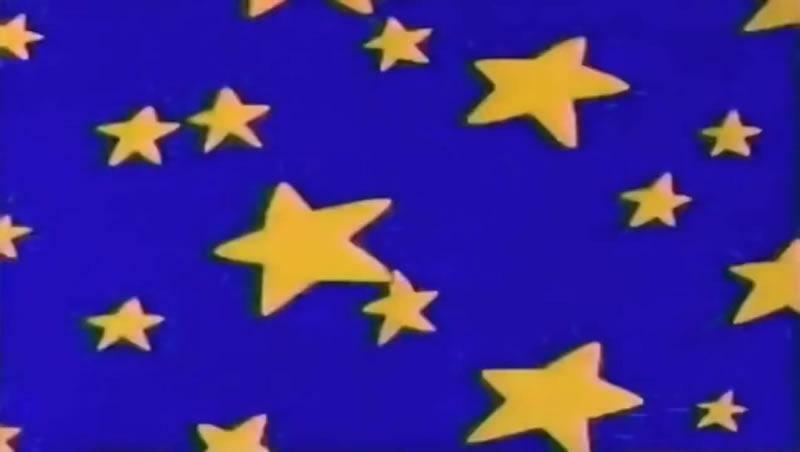 This would later be seen again in Super Mario 64 many years later. 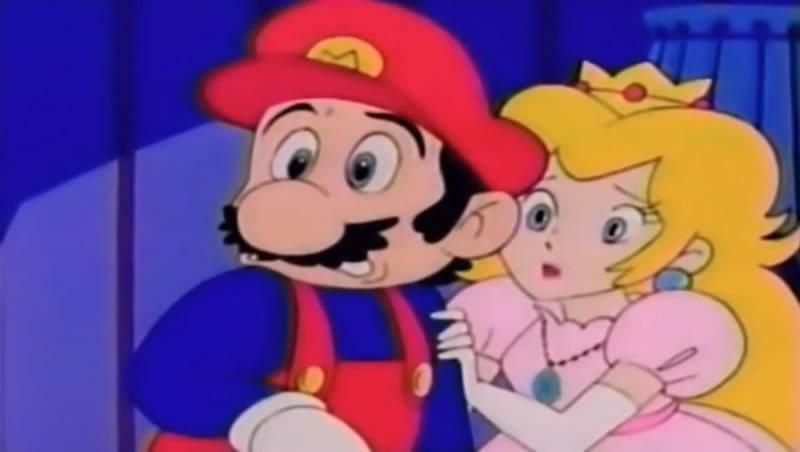 Princess Peach is seen as being in a relationship with someone other than Mario for the first (and only) time to date. There is a sign saying "Grouper" about eight minutes in, this is the name of the company behind this anime production. 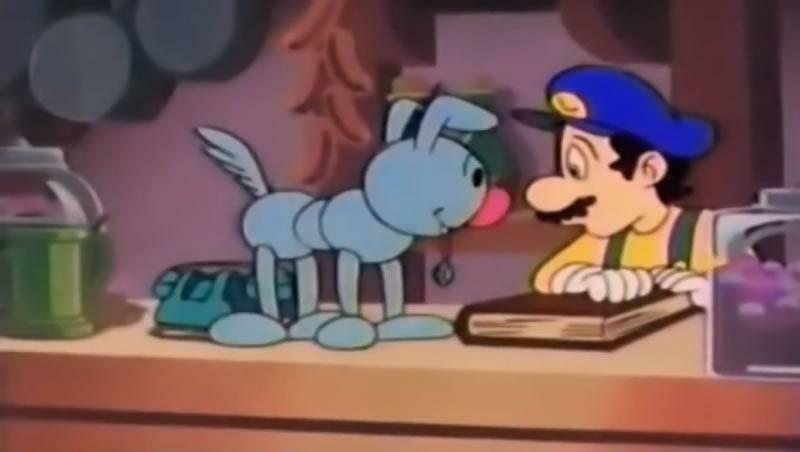 The "dog" that steals the emerald appears to have a lot of its characteristics based around the caterpillar enemy Wiggler from the Mario series. 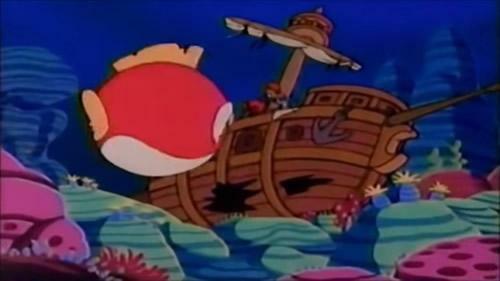 The sunken ship which Mario finds in the sea shortly after retrieving the star from a clam resembles the Sunken Ghost Ship from Super Mario World, this was one of many possible inspirations for the Sunken Ghost Ship in Super Mario World.